Christmas is an annual Christian holiday commemorating the birth of Jesus of Nazareth. It is celebrated onDecember 25, but this date is not known to be Jesus' actual birthday, and may have initially been chosen to correspond with either the day exactly nine months after some early Christians believed Jesus had been conceived, a historical Roman festival, or the date of the northern hemisphere's winter solstice. Christmas is central to the Christmas and holiday season, and in Christianity marks the beginning of the larger season of Christmastide, which lasts twelve days. Although traditionally a Christian holiday, Christmas is also widely celebrated by many non-Christians, and some of its popular celebratory customs have pre-Christian or secular themes and origins. Popular modern customs of the holiday include gift-giving, music, an exchange of greeting cards, church celebrations, a special meal, and the display of various decorations; including Christmas trees,lights, garlands, mistletoe, nativity scenes, and holly. 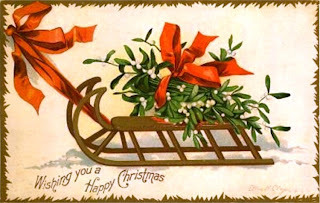 In addition, Father Christmas (known as Santa Claus in some areas, includingNorth America, Australia and Ireland) is a popular mythological figure in many countries, associated with the bringing of gifts for children.